Abraham Cruzvillegas’ work communicates a sincere complexity, fluidity, and vitality. He puts diverse objects from contradictory contexts together in one work, creating a conceptual instability on the verge of collapse. He often stacks organic matter, industrially made objects, or handmade items on top of each other to produce a visual clash. In Development as Freedom, he uses the skateboard as a base on which to carefully balance found wood and a perched dahlia root. 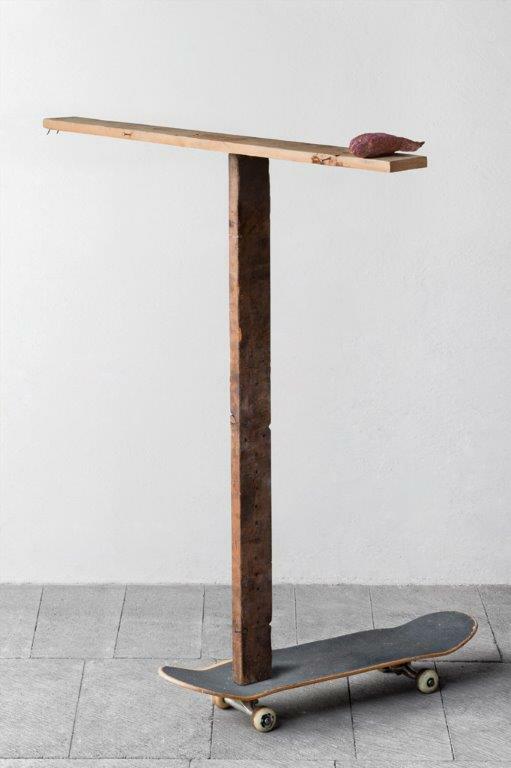 The skateboard, a manufactured object used for transportation, is transformed into a rooted plinth, and the dahlia root, an anchoring section of the plant, beautifully transforms into a sprout. Cruzvillegas lives and works in Mexico City and Paris. He has had solo exhibitions at the Walker Art Center, Minneapolis; Tate Modern, London; The Centre for Contemporary Arts, CCA Glasgow; Museo de Arte Contemporaneo de Oaxaca; Contemporary Arts Museum, Houston; and Fundación para el Arte Contemporáneo, Mexico City. His work has been included in group shows at The Museum of Modern Art Warsaw; Stedelijk Museum, Ámsterdam; Museum of Contemporary Art, San Diego; Museum of Contemporary Art Detroit; and DOCUMENTA (13) in Kassel. Cruzvillegas work is currently on display in the exhibition Mexico Inside Out: Themes in Art Since 1990 at the Modern Art Museum of Fort Worth.